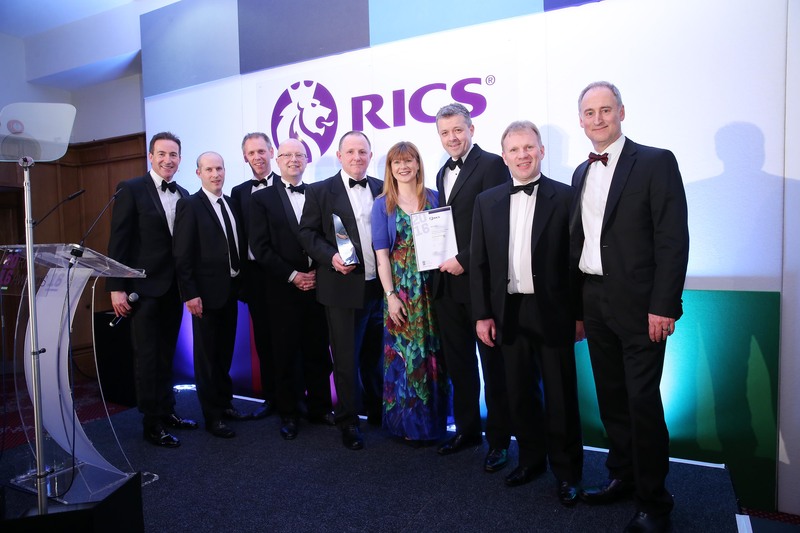 Wellcome-Wolfson Institute picks up double award at RICS Awards 2016! Queen's University research facility has been named Project of the Year at the Royal Institution of Chartered Surveyors (RICS) Awards 2016, Northern Ireland. The Wellcome-Wolfson Institute for Experimental Medicine, situated in the grounds of Belfast City Hospital, won the Design through Innovation award before being crowned Project of the Year at the annual awards, which showcase and reward projects from across Northern Ireland. The £32m Institute is the latest phase in the configuration of the School of Medicine, Dentistry and Biomedical Sciences and has been designed to enhance its internationally recognised excellence in education and research. The 9,000 square metre building provides accommodation for some 330 members of staff specialising in research into finding cures for eye diseases and diabetes, and the development of a global programme to aid understanding of the genetics of complex chronic diseases. The project's design team consisted of Ostick & Williams in association with Stantec architects, Turner & Townsend Cost Management Surveyors, Albert Fry Associates as the structural and civil consultants, Services & BREEAM Consultants White Young Green, O'Hare & McGovern as the Main Contractor and Harvey Group as the MEP Contractor. (Text/Image Credit: Northern Builder: Adam Hassin). To read more on this article please click "here"
John Nugent and Conor Kilgallen commended Harvey's for their part in the production and use of BIM Modelling at Queens, Wellcome Wolfson, alongside O'Hare & McGovern.